Private tours of Hyeres and Bormes Les Mimosas include: Private transportation and English speaking tour guide, taxes, tolls and parking. Departure Points: Toulon, Marseille. Other departure points available, inquire. 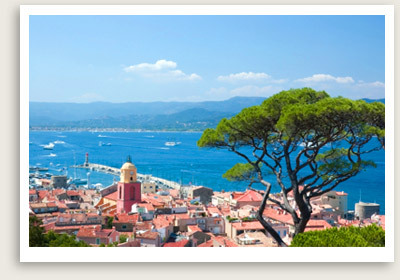 This private tour from Toulon begins in the sunny southern Provencial city of Hyères. Pristine sandy beaches, palm trees and rocky inlets stretch for miles across the city and its peninsula. Hyères was once a favorite summer resort of the rich and famous, whose magnificent turn-of-the-century homes still remain in the old city. Hyères is also a favorite spot for sailors and recreational boaters. You can visit historic sites such as St. Louis Church and the Commanderie des Templiers here. You can have lunch in Hyères or at your afternoon stop, the medieval village of Bormes les Mimosas. One of the most picturesque towns in Provence, Bormes les Mimosas is known for its namesake bright yellow flower, one of the few that blooms in winter. The village homes, some dating to the 12th century, are decorated with pink-tiled roofs and beautifully carved doors. There are many interesting historic monuments to visit here, including the Romanesque chapel of Saint François de Paule, the 13th century stone castle, and the city ramparts, offering a panoramic view of the plains and lles d’Or. You will have time to explore before the drive back to Toulon.